Koh Lipe is a tiny island in the very South of Thailand. To be more specific in the province of Satun, not far from the Malaysian border. 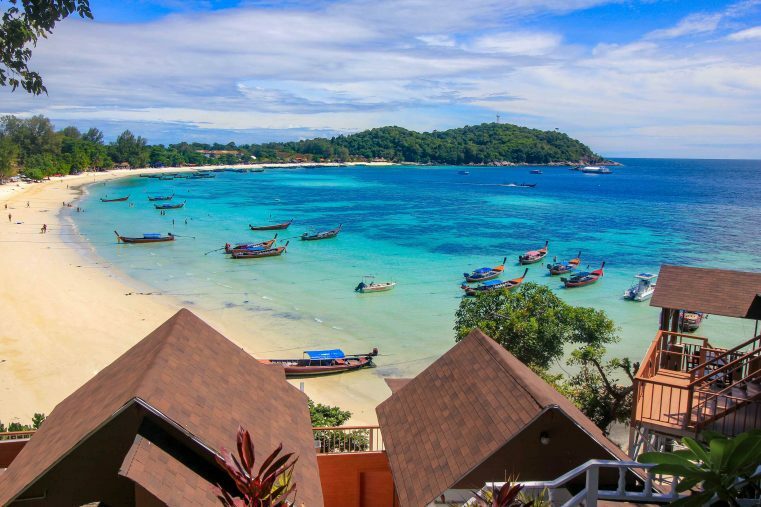 Especially the colorful underwater world and the surrounding coral reefs make Koh Lipe a popular spot for divers and for all who love snorkelling. But also, the island itself is beautiful. 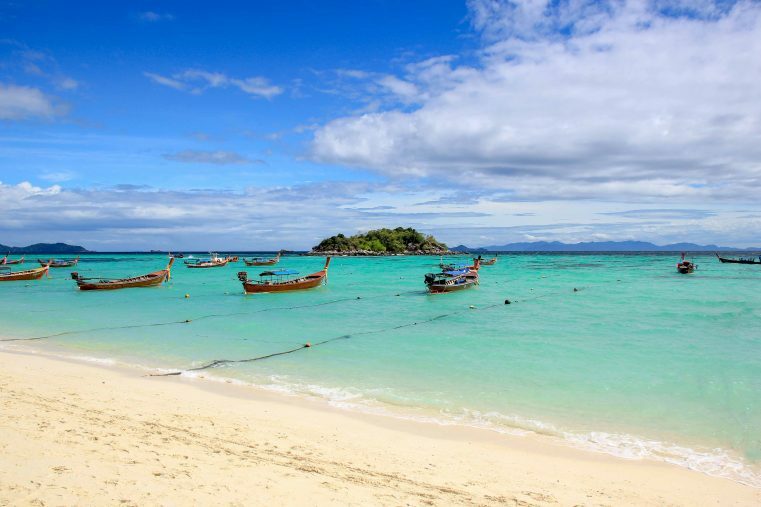 Many even consider Koh Lipe as the most amazing island of Thailand. 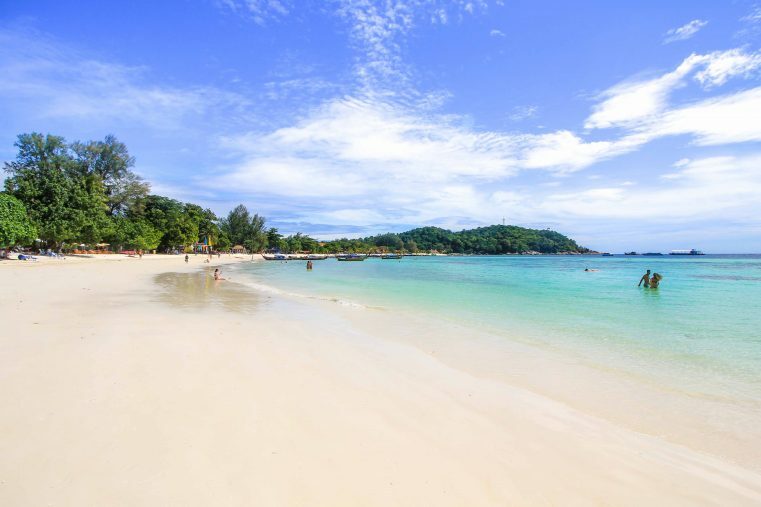 On Koh Lipe you will find beaches like out of a holiday magazine: white powder-sandy beaches and turquoise-blue sea make this place a popular holiday island. 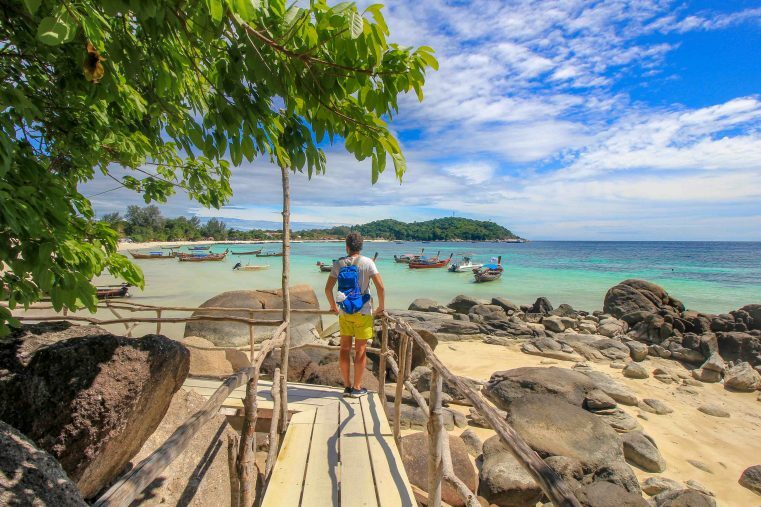 Whether backpackers or luxury vacationers, divers or beach lovers – a trip to Koh Lipe will guarantee an unforgettable holiday experience and going there is well worth it! 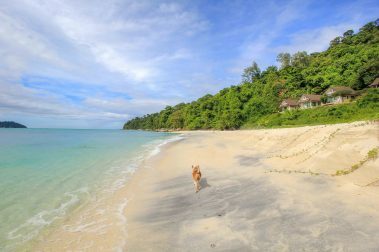 In this blog guide we show you the beaches of Koh Lipe and what are the best attractions and excursions waiting for you. In addition, there are plenty of tips and information about how to get there and best places to stay! 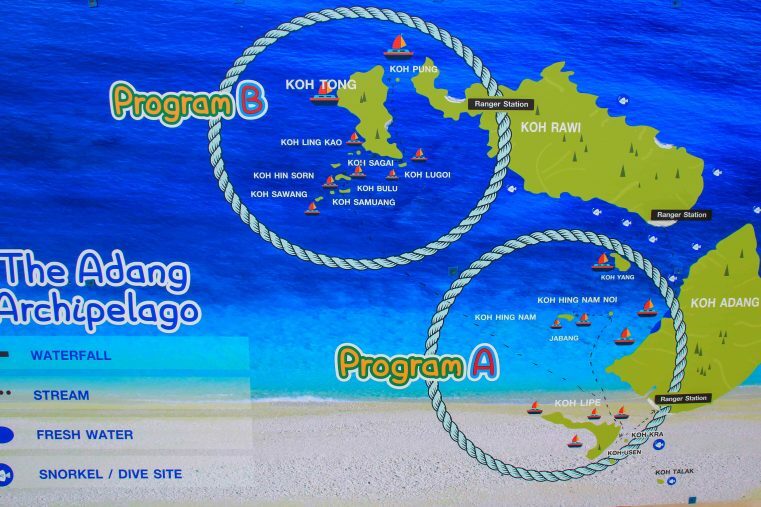 Perfect to plan you ultimate Koh Lipe itinerary. 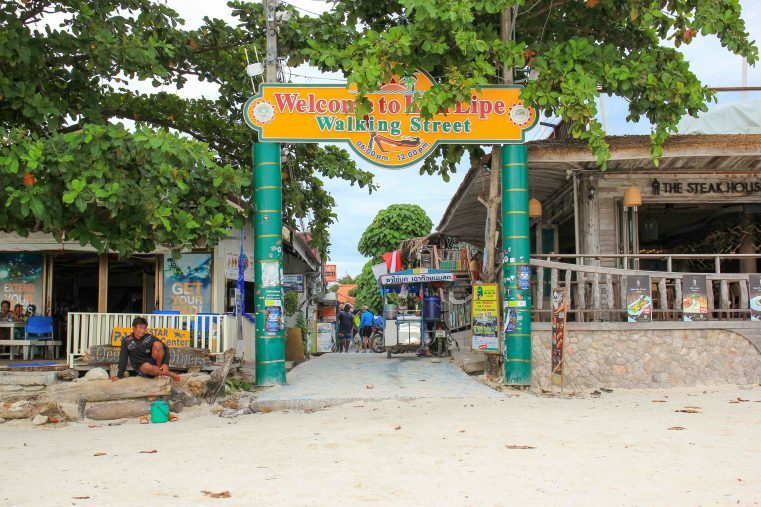 Koh Lipe Walking Street is a narrow street full of cool bars, delicious restaurants, cafés, shopping facilities, tour operators, diving schools, street food stalls with cheap food, halal food, massage parlours, hostels and much, much more. Also, if you are looking for an ATM and for currency exchange you will find plenty of them inside the Walking Street. During the day there is not much going on. 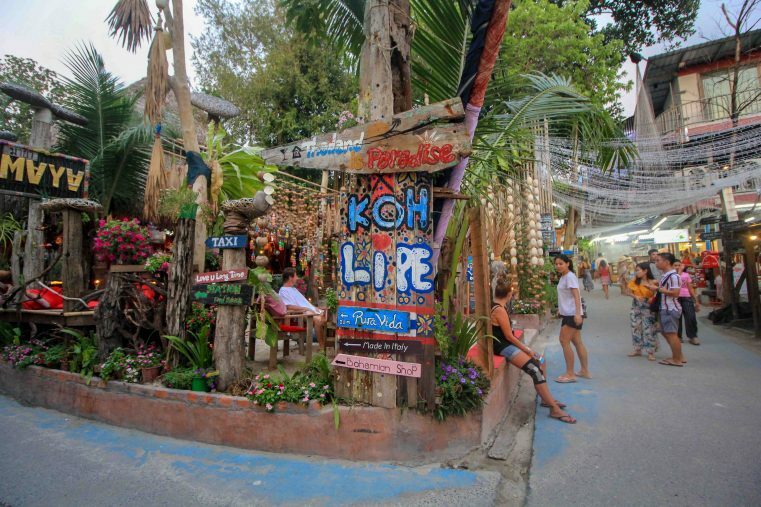 But after sunset the Koh Lipe Walking Street is the place to enjoy the nightlife, to eat and to celebrate. By the way, the entrance to the walking street is at Pattaya Beach and it almost leads down to Sunset Beach. Tip: One of the cosiest and best-rated backpacker hostels on the island is the Bloom Cafe & Hostel. Yes, it is hard to believe, but on this tiny island is a temple. Of course, this little attraction is not comparable to the famous temples in Bangkok, but actually this holy place has something very special about it. Tucked away in the jungle, hardly any tourist gets lost in this mystical place. Thus this attraction is a real insider tip! 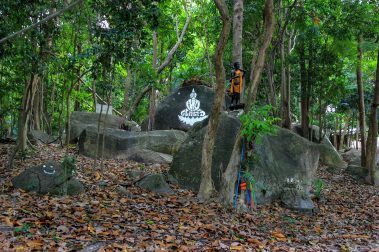 The Koh Lipe Temple can be reached by walking from Walking Street towards Sunset Beach. 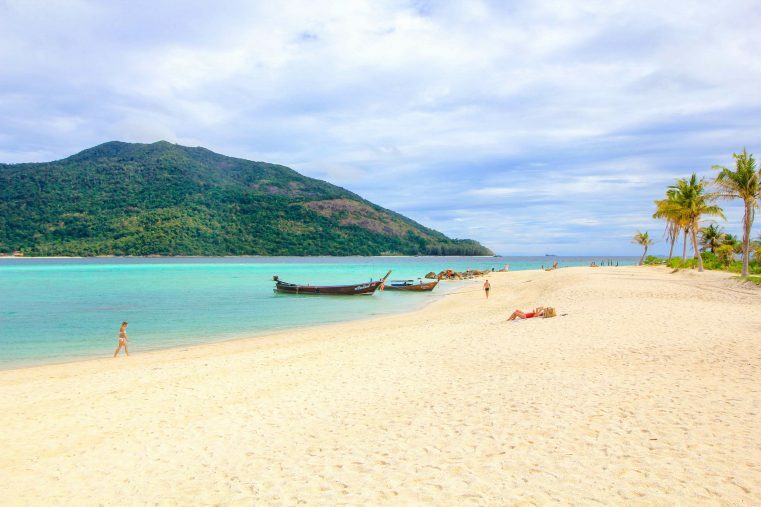 Koh Lipe has 3 main beaches and a few smaller hidden bays. Since the island is pretty small, you can theoretically get around all the fantastic beaches in one day. Or enjoy a new paradise bay each day. Koh Lipe is not over-crowed, like some says, and you still find enough quiet places to relax. But which beach is the best? 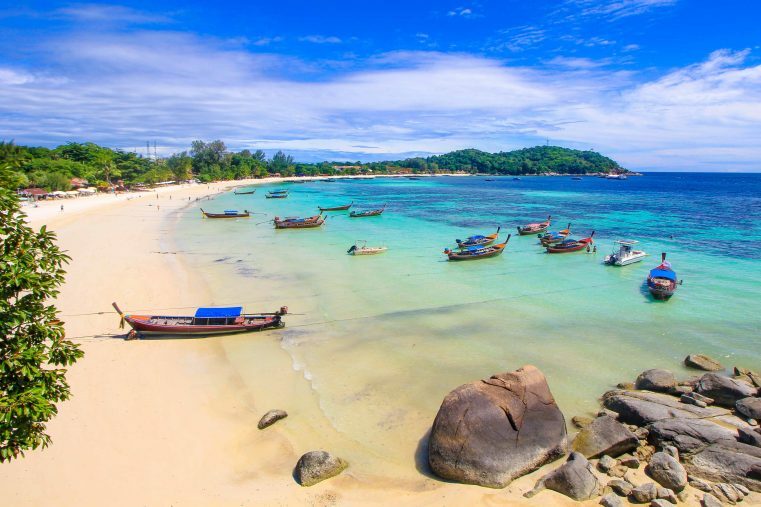 Here are the absolute best beaches of Koh Lipe, that should not be missed. 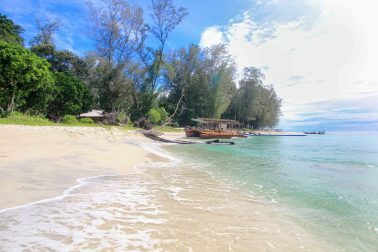 For many visitors, the Karma Beach is the most beautiful beach in Koh Lipe and also, we found this place just breath-taking. Furthermore, there is one of the best viewpoints on the island. Up there you have an incredible view down to the Karma Beach and the impressive sandbank. Also, you will look over to the neighbouring islands such as Koh Adang. Those who love snorkelling will find some good spots at the end of the beach! 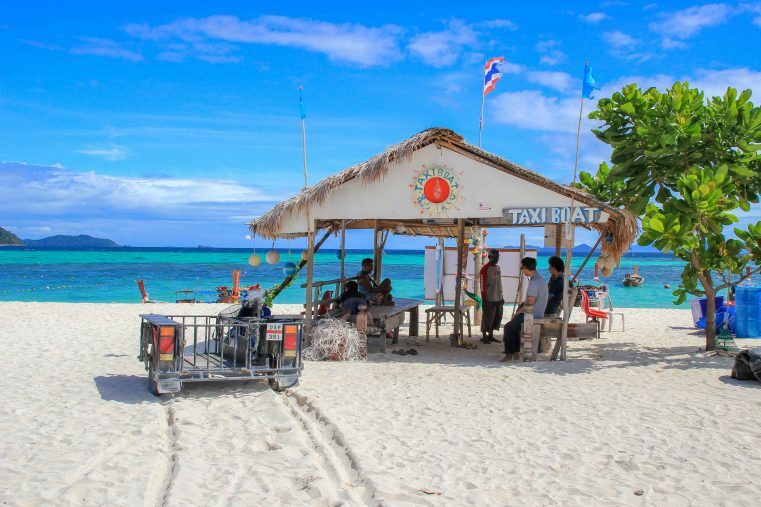 The Karma Beach with its impressive white sandbank is one of the top attractions of the island Koh Lipe and a visit is highly recommended. Tip: This amazing view can be found from the viewpoint of the Mountain Resort. While having a cool fruit shake at the restaurants terrace, you can marvel at this incredibly beautiful atmosphere. The Sunrise Beach is probably one of the most popular beaches of Koh Lipe and is well known for its picturesque sunrises. Also, this beach is absolutely heavenly and the place to be at sunrise. The beautiful white sand invites to relax and enjoy the amazing colors of the turquoise blue sea. At the southern part of the beach you will find some cozy beach bars and great accommodations. For swimming, you should visit the northern part of the beach. That beautiful part of Sunrise Beach is adjacent to Karma Beach and is also suitable for snorkelling. 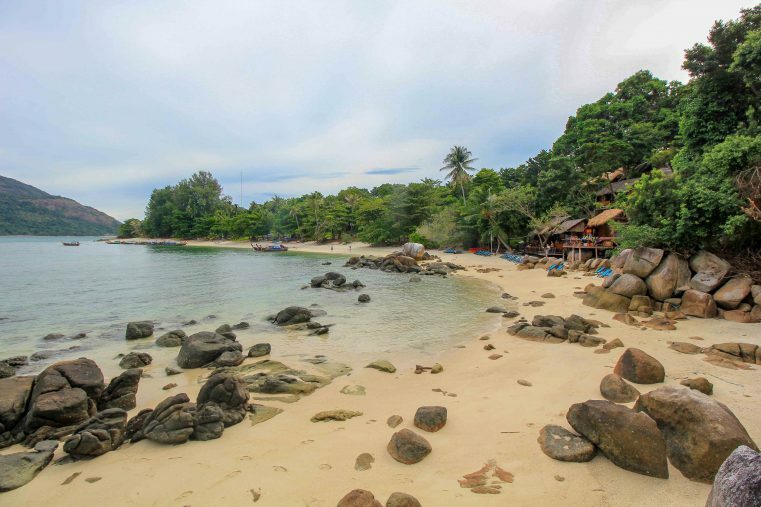 Tip: Sunrise Beach is a fantastic starting point for excursions to Koh Adang. Here, you will find taxi boats to get to Koh Adang. Prices and departure can be arranged there directly. Sunset Beach is one of the quieter beaches on Koh Lipe. Here you will hardly find any tourists. Instead there is really relaxed atmosphere, a handful of cozy bars and some budget accommodations. This beach is also great for snorkelling and the many trees provide cool shade. Many come here only in the late afternoon to experience the Sunset Beach for its famous sunsets. 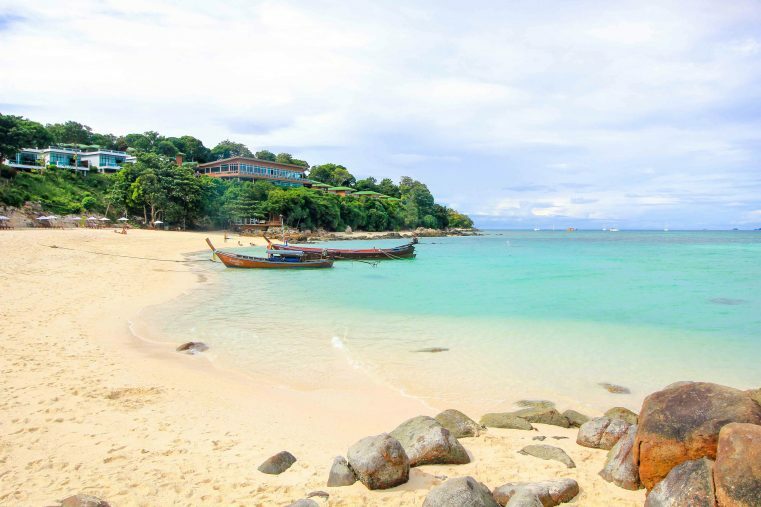 The Pattaya Beach is the island’s main beach and is located in the southern part of Koh Lipe. The approximately 1.5-kilometer long beach has direct access to the Walking Street and along the long bay there are many cool bars and restaurants. In case you want to swim here, you better choose the lower end of the beach. The upper part is always very busy with transport boats coming and going to the island. Nevertheless, the beach is really nice. Again, here you will find, an absolute Caribbean flair, turquoise blue sea water and white fine sand. Tip: The Chareena Hill Beach Resort spoils its visitors with incredible views of the entire Pattaya Beach! The Sanom Beach is our favorite beach! It is still one of the absolute insiders’ tips for Koh Lipe. In this small bay you will find velvety white sand and beautiful crystal-clear sea. On the beach itself is only one bungalow area and if you stay here, you can call this idyll almost your own. 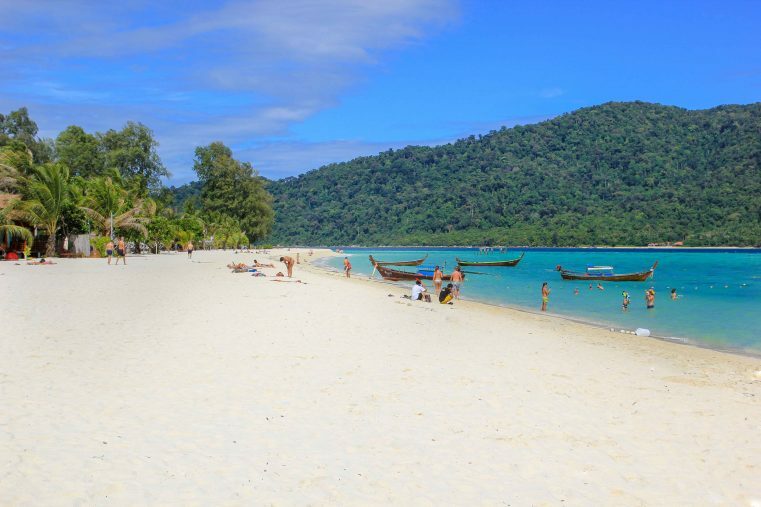 Of course, non-guests can also visit the beach, so don`t miss this jewel on your Koh Lipe itinerary! Tip: At the bottom of Pattaya Beach, a small wooden walkway leads over to Sanom Beach. You want to see Koh Lipe from above? 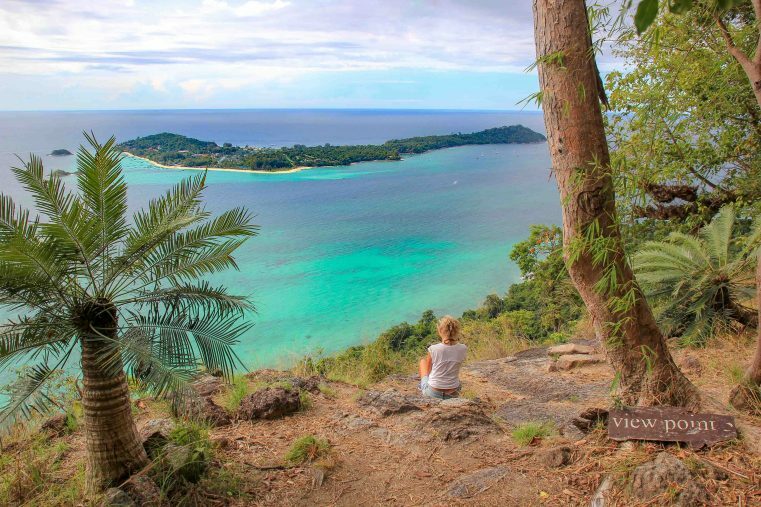 Then you should definitely hike up the Koh Lipe Viewpoint located at Koh Adang island. From here you have the best view down to the complete island. Hiking up won`t take you long, there are 3 viewpoints – the first is after 15 minutes. 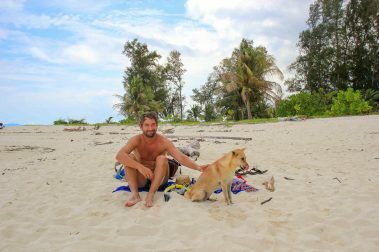 If you are lucky, the friendly island dog will come with you. Ko Adang can be easily reached by long-tail boat from Sunrise Beach. Also, the islands beaches are a dream, great places for snorkelling and swimming. As mentioned above, Koh Lipe is the ultimate divers Mecca in Thailand. Not surprisingly, there are a variety of diving schools, dive centers and snorkelling tour operators. The underwater world around Koh Lipe is unique and so even experienced divers can`t stop talking about their amazing dives. Prices for the diving Day Tours or diving courses can be found here. But also on a snorkelling excursion you will be amazed by the extremely species-rich and colorful marine world. There are colorful soft corals and small nemos (clown fish) waiting for you to get discover! Mostly, there are 2 different snorkelling tours offered. 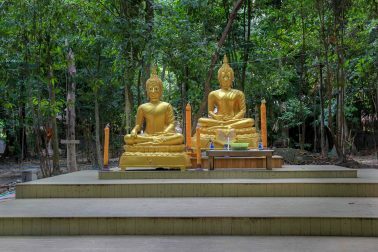 Depending on the tour, you will visit Monkey Island (Koh Dong), Koh Adang, Koh Rawi, Koh Yang, Koh Hin Ngam and many more! 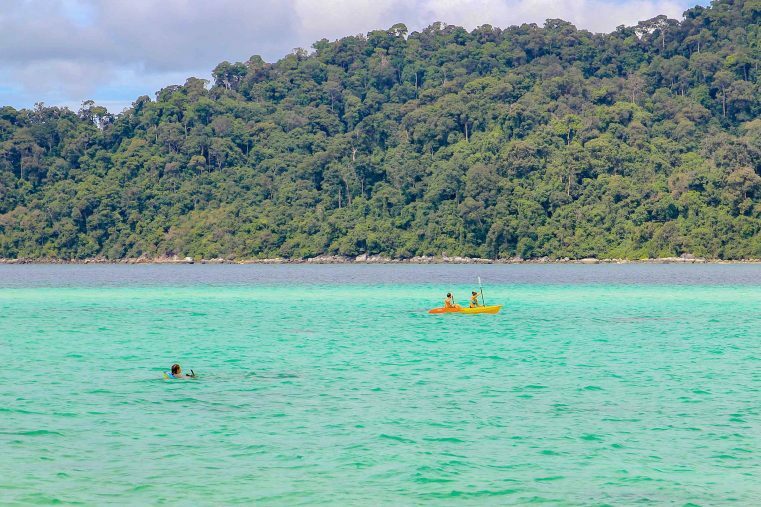 Another great activity on Koh Lipe is kayaking. With a kayak you have the opportunity to experience this beautiful island from the sea and take some amazing pictures. Sporty people circle the island in about 3 hours and at the same time, they have the chance to explore the most beautiful beaches of Koh Lipe. Enough drinking water and sun cream is a must for this excursion. Kayaks can be rent at various hotels and resorts. The island Koh Lipe doesn’t have its own airport. 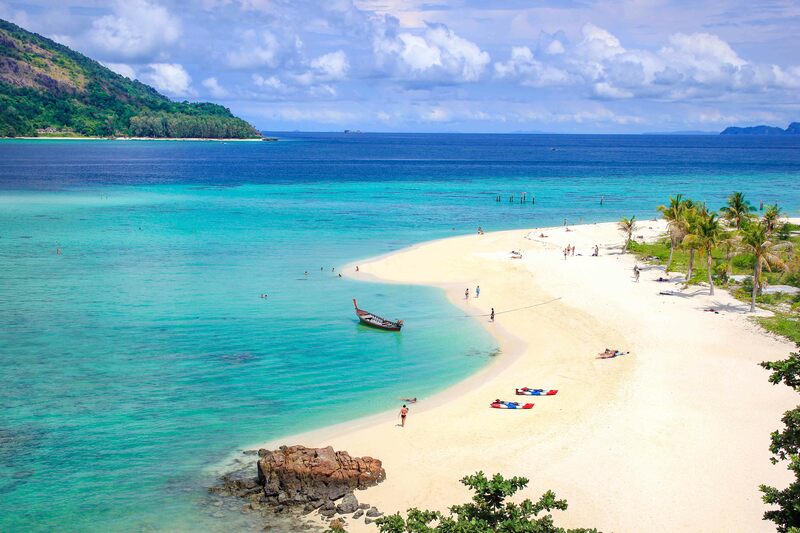 The name of the nearest airport from Koh Lipe is Hat Yai. Getting from the mainland can be arranged by speedboat transport. First you go by minivan from the airport to the Pakbara Pier and from there by boat to Koh Lipe. Tip: Tickets for flights can be easily found at Skyscanner or Kiwi. 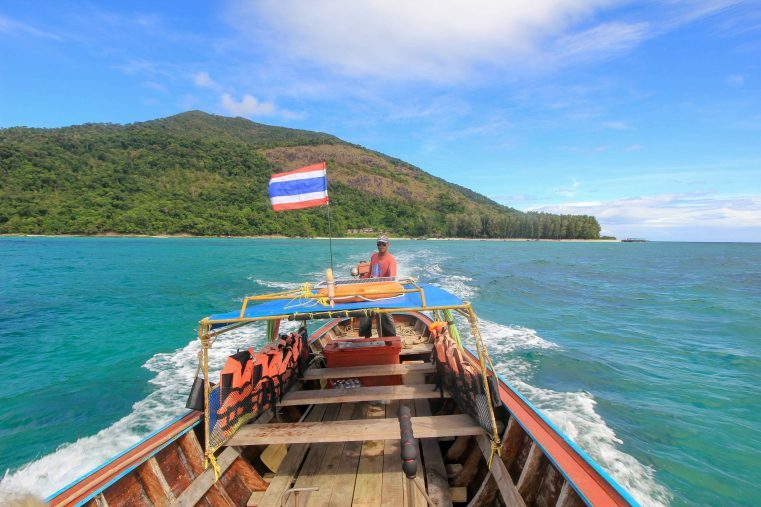 Although the island is located in the south, the journey to Koh Lipe is very easy to organize. 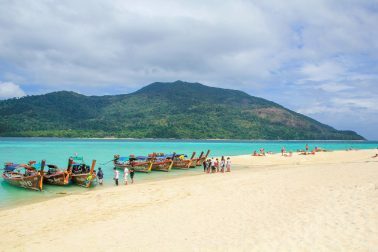 During the peak season, daily ferries and speed boats operate from Koh Lanta via the small islands of Koh Ngai, Koh Mook, Koh Kradan and Koh Bulon. 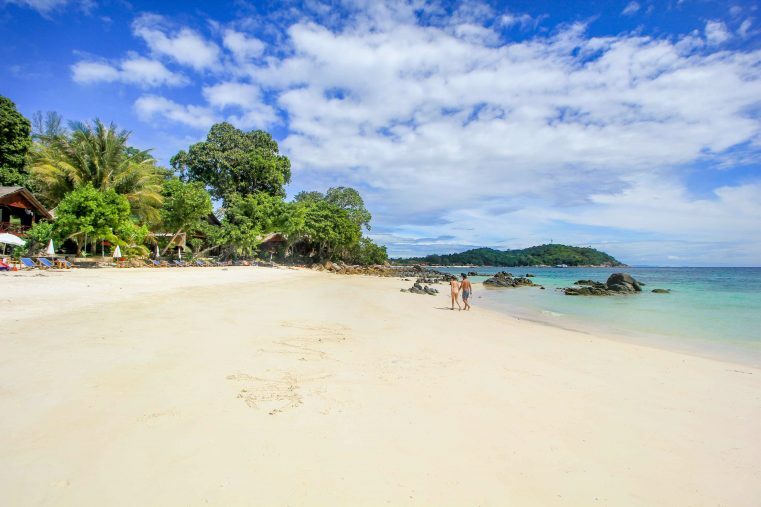 More you will find here: Thailand Island Hopping – from Krabi to Koh Lipe. The trip by speed boat from Koh Lanta to Koh Lipe takes about 3 hours. Also there a great possibilities to go from Malaysia Langkawi to Koh Lipe! The immigration office is located directly at Pattaya Beach. Tip: At 12go.asia you can find the exact ferry times and you can buy your transfer ticket and ferry ticket in advance. Because the island is part of the Tarutao National Park, there is a 200 baht National Park fee on Koh Lipe. Keep the receipt, as if you go on a snorkelling trip or visit Koh Adang you have to show this. The climate and best travel time to go to Koh Lipe is from November to April. In the months of March, April and May it will get really hot. December, January and February it is high season and by far the most expensive travel time. Before and after it is almost low season and the prices of accommodation on Koh Lipe will drop. The rainy season usually starts in May and lasts until the beginning of November. In Summer, July and August, you have to expect partial rainfall. Of course, there are also sunny days during this time. Hostel: The Bloom Café and Hostel is one of the best hostels on the island. It is located super centrally inside the Walking Street and all major beaches are reached via a short walk. Bungalow at the Beach: Zodiac Beach Resort is located on Pattaya Beach. Especially nice is the direct beach location and the clean wooden cabins. Top Accommodation: The Ten Moons Lipe is located right on the Sunrise Beach of Koh Lipe. Best is the large and intact coral reef just right in front of the hotel; perfect for snorkelling!